I had a pastor who said, “Confession is great for the soul, but terrible for the reputation.” Well, here it goes. One of the reasons I procrastinate on things is because they are so important to me. For example, I have a dozen or more Psalms that I have half-written. I love the music I’ve written so much that I struggle bringing myself to finish the song, because I’m afraid it won’t live up to what I’ve written so far. I’ve drug my feet on writing this post for this very reason. It’s so precious, so sacred, that I’m almost afraid to touch it. You see, I believe this verse is talking about what my Lord Jesus Christ did for me on the Cross. So when we sing the Psalms, we should always have one eye on the lookout for Jesus. And in this verse, I saw that in the New Testament, when God remembers our offerings and our burnt sacrifice, it’s not primarily about what we have offered or what we have sacrificed. It’s what Jesus did for us, on our behalf. And what was this one sacrifice, this one offering? It was His own life, which He gave for us on the Cross. It was He who was and is our burnt offering - when He suffered the fiery indignation of God’s wrath on our behalf. We can always - always - come back to the one great Offering and the one great Sacrifice. The most significant day in the history or future of the human race: when the Son of God died so we could live. And the result of that one sacrifice? ​​That I would not be angry with you, nor rebuke you. In other words, the Lord will flood the earth with water before He is angry with you. He will cast every mountain and hill into the sea before He removes His kindness and His peace from you. The issue is no longer whether God will remember the offering and burnt sacrifice - but rather will we remember? I have felt very discouraged lately. For many reasons, but ultimately I think it boils down to this: things haven’t gone the way I’ve expected them to. And so I have battled depression, anger, frustration, and fear for the last few weeks. Truthfully, most of 2016. I would go so far as to say this year has been the most emotionally and spiritually challenging year of my life. So these words - strengthen you - here in Psalm 20 are very appealing to me. 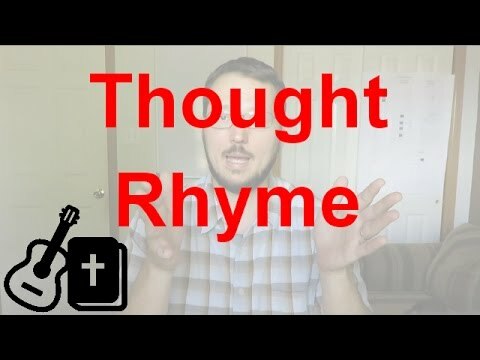 And from what we recently investigated about “Thought Rhyme” we can look at the two lines of verse 2 as being slightly different angles on the same idea. So again in context from verse 1 - this is about “the Day of Trouble.” And God’s solution? To send you help. And what kind of help? Strength. Very interesting. It’s not necessarily a deliverance - at least not yet. The first thing God wants to do to help you is to strengthen you. And although there are many ways God can and does strengthen, there is one in particular that I want to focus on: prophecy. Yikes. That can be a scary word. Images of Old Testament prophets calling down fire and casting judgments over nations come to mind. Or perhaps you’ve been exposed to some modern day self-proclaimed prophets, who foretell of strange things such as the end of the world, or that God is going to send you to Africa, or something that is just… way out there. In everything, I think there is a healthy balance. So there are three results of prophecy: edification, exhortation, and comfort. To strongly encourage. To strengthen. So prophecy is not primarily meant to give you direction (though it can at times). It is really meant to exhort you: to encourage you; to strengthen you. I believe God gives prophetic words to give a picture of what the end result will be. So that when the world seems to fall apart around you, you can hang on to this promise and know that everything will turn out okay. Then Saul tried killing David. Several times. Can you imagine if the president of the United States put out a kill order on you?! Do you think you’d be afraid for your life? Take some time and imagine that. It will help connect you to where David was in his heart through this period. So David flees. He gets out of town. And Saul sends his army after him. Every day. I imagine it was a terrifying experience: sleeping with one eye open, always having to look over his shoulder. I imagine David thought back to that time the prophet Samuel came and anointed him with oil and told him he would be king of Israel one day (1 Samuel 16:13). The Bible doesn’t explicitly say that David had those thoughts, but I think they are very reasonable thoughts to have in that type of situation. And I can admit I’ve had thoughts along those lines this year. The day of trouble can be very discouraging. Very disheartening. Jonathan pointed David back to the end result that Samuel had already established (in chapter 16). He opens a later chapter in the book of David’s life and says, “look, don’t be afraid… you shall be king” - so even though he’s living in the wilderness of a forest, even though the king is hunting him down - somehow he is going to get through this. That is a wonderful example of prophecy. Very simple, but very profound. In the middle of the world falling apart - David was reminded of his future. It’s interesting that there is no record of how Jonathan knew that David would be king. Was it common knowledge that Samuel anointed David? I don’t think so. Samuel said, “If Saul hears [that I am going to anoint David as king], he will kill me.” 1 Samuel 16:2 So I personally think it was done in secret. Don’t despise prophecies just because some people have misused the term. Prophecy is God’s gift to His people to strengthen us; to encourage and exhort us. And if you’re needing strengthening in the Day of Trouble, trust that God will give it to you. It may come from a person. It may even be that the person doesn’t know they’re prophesying to you. They don’t say, “thus saith the Lord”. The just say something to you that hits you right in your heart and strengthens you. And His strengthening may not come from a person - it may be a verse of Scripture that God highlights to you. It may be a sign on the side of the road. It may be a dream you have. Or, as happened to me this week, it may be revisiting older blog posts that I wrote myself, which ministered to the very heart of what I’m struggling with. And in any case, recognize that though the message may be delivered through various forms, it is coming from the Lord Jesus Christ just for you. May the Lord send you help and strengthen you in the Day of Trouble.